Ray Labbe & Sons, Inc. is a family owned and operated construction company that has been providing the greater Mid-Coast area of Maine with quality services and products since 1955. Our construction team brings expertise in many areas including site work, paving, utilities, and demolition. Customers agree that the quality of aggregates produced in our quarry and pit locations are second to none. Over the last 60 plus years Ray Labbe & Sons has built a reputation for quality products, service, and customer satisfaction. Recently we were awarded “Business of the Year” by the Brunswick Downtown Association as well as the “Major Achievement in Construction” award by the Associated General Contractors of Maine, which is their highest honor. Satisfying our customers has always been the hallmark of our company, along with the ability to meet and exceed expectations for superior service. We welcome the opportunity to work with you on your next project. On March 6, 1951 Raymond and Madeline Labbe relocated from the Old Orchard Beach area to the town of Brunswick, Maine. Together they established Ray's Sunoco, a full-service gas station located on the Bath Road. Ray's Sunoco not only sold gasoline and serviced automobiles, but also offered the community other services such as welding and snow plowing. As their business continued to grow, they purchased their first piece of construction equipment, a used front end loader. Ray's Sunoco could now offer excavation services for residential and commercial customers. Not only was the business growing but their family was beginning to grow as well, as Madeline was expecting their second of eleven children. 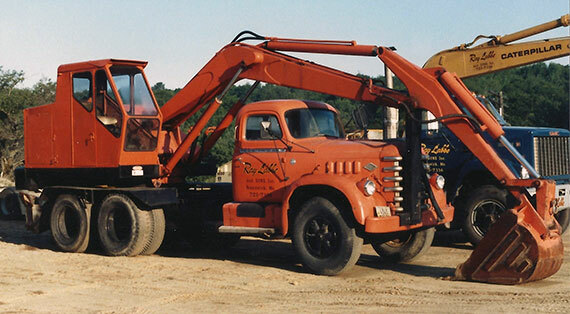 In 1955 Raymond and Madeline decided to sell the gas station and start operating full time as an excavation company, under the name of Ray Labbe Trucking. They purchased a new D4 Caterpillar bulldozer, two dump trucks, and traded the old loader for a used Trojan backhoe loader. 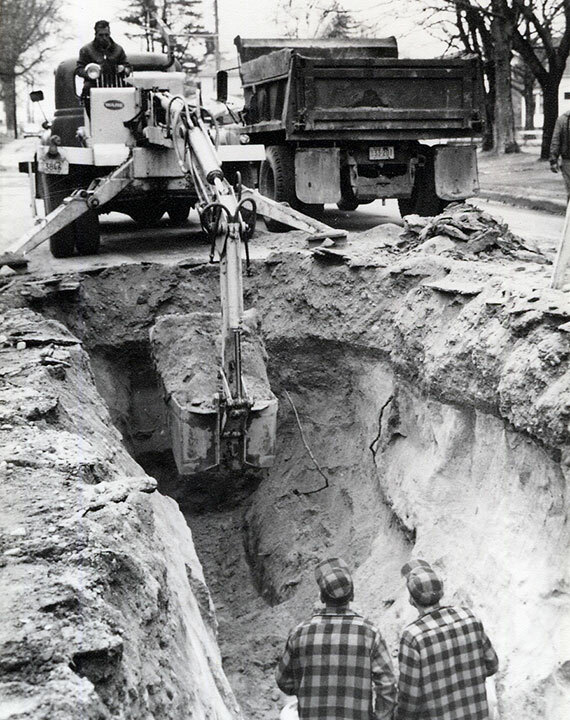 As they kept busy, Ray excavating and Madeline driving trucks, they provided services for local residents, the Brunswick Sewer District, the Town of Brunswick, local contractors, and the Brunswick Naval Air Station. In fact, their first major project was working as part of a team to surface the runways at BNAS when the base was being reopened as a permanent military facility. As the business grew, Ray Labbe Trucking needed a place to provide sheltered maintenance on its equipment as well as more room for storage of parts and materials. In the 60's, they purchased the former Bay State Ice Cream garage on the Highland Road, a quarter of a mile from their home. Their first four children were girls and as they grew, they helped out more and more with the family construction business, operating equipment and driving trucks. When the next three children, all boys, were old enough, they also began working for the business. 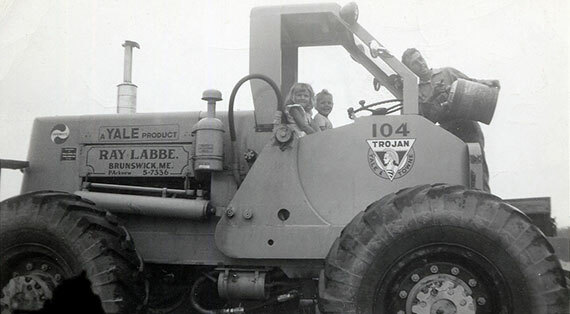 Paul, the oldest son, was very young when he started operating equipment for the company. Because he wasn't old enough to have a driver's license, Madeline would deliver the necessary equipment to the job sites for him to operate. Ray was the second son to join the company at an early age and even purchased his own wheeler dump truck right out of high school. Ray has always worked for the family business and, as the years went by, became more involved in the fiscal management of the company. Peter, who started out as a part time employee while also working for the Officer's Club at the Brunswick Naval Air Station, joined his brothers on a full time basis upon graduation from high school. 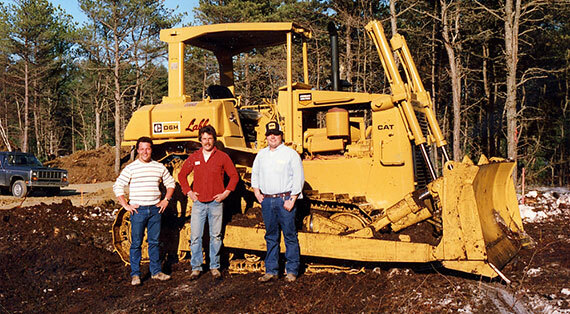 Paul, Ray and Peter eventually purchased the family business from their parents, and in 1982 incorporated under the current name of Ray Labbe & Sons, Inc. At that time, business consisted of a backhoe loader, an excavator, 2 dump trucks, 2 bulldozers, and a small grader. Every year they purchased more heavy equipment and trucks, which allowed the company to have steady and healthy growth. In 1990 management decided that paving would be a profitable and compatible market to enter, so a paver and rollers were purchased. This turned out to be a sound business decision as paving is now a very important service offered by the company. To ensure an economical and reliable supply of materials necessary for their jobs, the company purchased a gravel pit in Brunswick in the mid-1980's, and later a quarry in Bowdoin in the late 1990's. Not only do these pits support the internal material needs, Ray Labbe & Sons now supplies material to many area businesses, contractors, and homeowners alike with products that are among the highest quality in the region. To round out the services offered by the company, they keep busy during the traditional slow season by providing snow removal to many area businesses. Then in 2013 they also began producing small batches of hot-mix asphalt during the winter months when all other plants in the state are closed for the season. This creates income during the winter and allows Ray Labbe & Sons to maintain a large portion of its workforce when the construction industry in Maine is slow. With hard work and laborious hours, these three brothers have taken this small family business and made it what it is today. Ray Labbe & Sons currently has a full fleet of operating equipment and trucks and is well respected in the industry. They employ about 60 men and women, which still includes some family members. Honesty and exemplary work ethics shaped this company into what the community refers to as the “FLEET THAT'S HARD TO BEAT”. © Copyright Ray Labbe & Sons, Inc.